BBC World News journalist and producer Lorna Blount shares how her childhood passion inspired her to work in media and be confident. Can your job be your passion? If you are passionate enough, you can shape your future and do what you love every day. Lorna Blount is a BBC World News journalist, producer, and social media expert. She transformed her passion for interviews into a career that allowed her to travel all over the world. Working in media is not easy. Lorna covered all types of news including natural disasters and faced people’s judgment. Yet she stayed true to herself and remembered to smile. Lorna loves her job so much that she never disconnects. She says her passion allows her to find fascinating things that keep the fire going. Do you want to be confident and have a career you love? Discover more here and remember to share it with your friends and spread the passion. Moustafa: Hello everyone and welcome back to Passion Sundays, the best way to end a week and start another. Our guest today is an experienced BBC World News journalist who traveled the world covering all forms of news – Lorna! Thank you very much for being with us today! Lorna: Thank you for having me! Moustafa: I’m really excited to talk to a fellow media person, particularly to somebody who works for an organization like the BBC. Covering world news is not an easy task. So tell me. Where did you get the passion for what you’re doing? Lorna: I think as a child, I’ve always loved speaking to people and interviewing them. Even when I was like 7 years old, we used to have people coming to the house, workmen or anything. I used to interview them. Going round the house interviewing everybody. When we had big events, I’d watch TV with my family and then I’d go upstairs and I’d write down everything and I’d come back down and like, do stand in for my parents and like read a news report. And I got into… my friend’s job was at SkyNews. And I got into that because I made a documentary which they bought off me. And I think, you know, I’ve always been… I’m a nosy person. I love meeting people, I’m sure just like yourself. And when I realized that I could make that into a career, I mean, you know, it was a win-win. Moustafa: Super. It must have been tough along the way because you are talking about the beautiful times when they bought it from you. And you are keeping the good memories. But I’m sure that along the way you might have had tough times. How did you define passion in those times? Lorna: I mean, working in media is tough sometimes. I mean, I was lucky that I, you know, got a job straight away. A lot of people, a lot of friends of mine struggled because there is not many positions. And I’ve covered… I’ve covered some really hard things. I was out living in Singapore working in the bureau there when we had the typhoon in the Philippines. And I had to go over there and it was… you know, I’ve been in some really tough situations. And there have been times when you’re judged. You’re judged for what you say, you’re judged for the way you look. I don’t know, I’ve always just tried to keep my confidence and to try to be true to myself, you know? And everyone comments thrown at them. And I think that if you take everything on board, you’d never succeed. You just got to try and keep a smile on your face, really. Moustafa: Sometimes when it’s tough, the only thing to do is to keep smiling. Moustafa: So what does passion mean to you? Lorna: What does passion? Passion for me is… My job is my passion. My friends, my job and my passion. It means that you know, I want to get out of the bed, I wanna do it. It’s something that I never switch off, you know. I go to bed at night and I’m on my phone. I am trying to find the latest thing, I am trying to connect with people. It’s something that excites me. You know, if gets that fire inside you? Moustafa: Beautiful. And how do you keep that fire going? Lorna: By meeting more people. By going, learning, having more experiences. I mean, we are here in Dubai and, I’ve been here for 3 days and I’ve held workshops with the government, with the Abu Dhabi media, meeting – I’ve met hundreds of interesting people. And it’s just so exciting, having new challenges. I think if you don’t have that, you get bored and you won’t love your job. You just always got to try. Try to push yourself. Moustafa: Find challenges to keep the passion alive. Moustafa: Thank you very much for this amazing interview! Lorna: Thank you so much! Thank you! Moustafa: What do you think? I would really love to hear your opinion. So if you find this interview as useful as I did, leave your comments on the blog below and do share it with your friends. And if you’d like more tools, tips, techniques and exclusive interviews that I only share on my website, go to Moustafa.com. 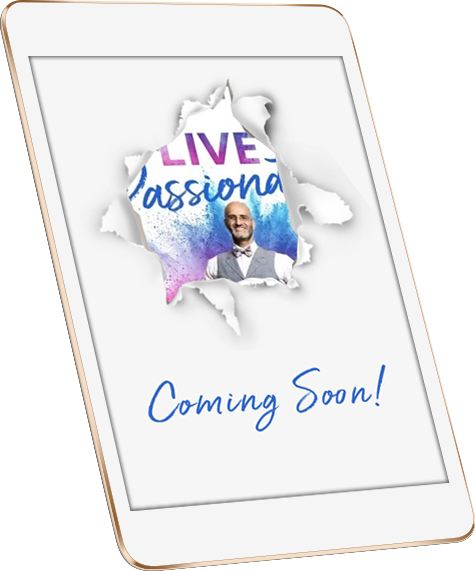 And until the next episode, live passionately!